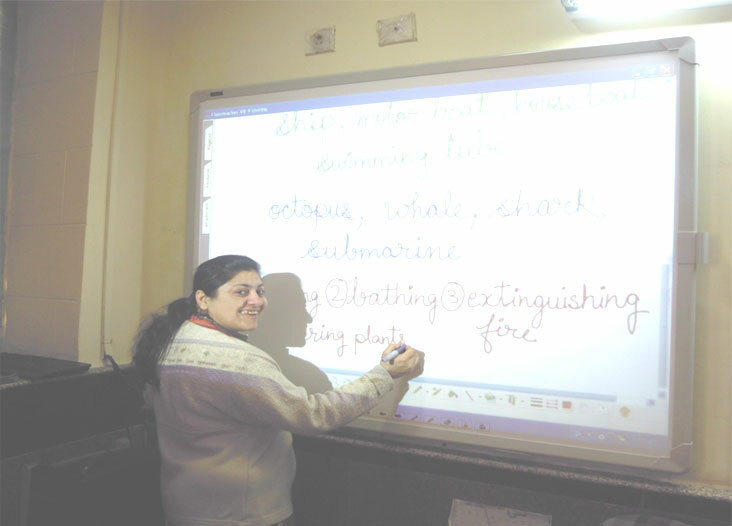 Digital Classrooms – When technology enters in the classroom !!!! We recognise children to be individuals with their rights. Children of today are active and competent. They enhance their surroundings right from the start, as well as, be influenced by it. keeping in view the above lines, K.R. Mangalam World School , Paschim Vihar with a dynamic vision approaches towards education in accordance with the changed needs of the new millennium which balances teacher planned and child initiated learning , emphasizing responsiveness to children’s strengths, interests, needs and learning styles. So, our branch focuses on the digital classrooms. This technology integrates digital tools for effective teaching, learning communication and evaluation. We have interactive boards in each classroom where the Class Forward application is followed. This application helps in coming out of innovative way of teaching with technology enabled education making the students flexible and tech-savvy. It is believed that a picture is worth thousand words and this technology truly justifies, as it expands the source of knowledge and makes the learning more enjoyable and fruitful.